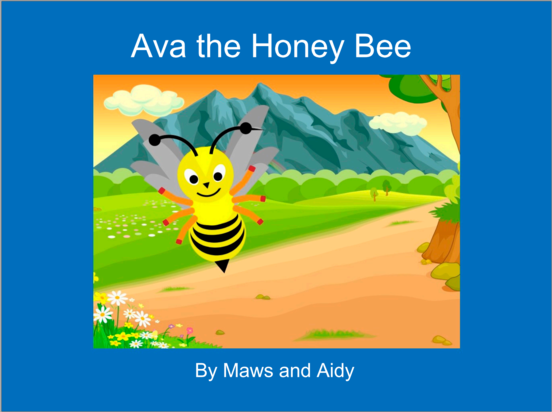 Ava is the youngest honeybee in her home. Her home is a beehive in a tree. Ella, her older sister, is teaching Ava to find pretty flowers in the field nearby. These flowers have pollen that bees use to make honey. Bees collect pollen from the flowers and take it back into the hive. If a bee finds flowers with lots of pollen she will tell others in the hive where they can find these flowers. Have you ever heard a bee speak? No, a bee can’t talk but she can tell other bees where the flowers are by doing a dance which points to the spot. So, that’s what Ella is able to do. She finds pretty flowers with pollen and brings it back to the bee hive. And she does a little dance to show the other bees where she has found the pollen. Ava, the young bee, is watching and learning from Ella, her older sister. Soon Ava is able to find flowers on her own. One day when Ava is flying around she sees something that worries her. There is a big tractor taking down trees nearby. Their home will be taken away if they don’t move their hive somewhere safe. Back in the hive she tries to tell the other bees but no one will listen. Ava goes to Ella and tries to tell her but Ella doesn’t listen either. But Ava keeps telling Ella to come with her and have a look at what she’s found. Eventually Ella gives in and flies with Ava to see where the trees are being taken down. Ella now sees that she must tell others in the bee hive what’s happening. But the other bees won’t listen to Ella either. So Ella tells her friend Charlotte and her cousin Olivia, who tell their friends. Soon there are lots of bees who understand what’s happening and eventually the bees all realise they will need to find a new home. And so Ava and Ella have saved the hive and everyone is very happy in their new home. Posted in Change Instigator and tagged bee dance, change initiator, change instigator, change management, communication, leadership, persistence.